The 1581NA-D compact power amplifier modules capable of driving small speaker loads in a GLOBALCOM® system. 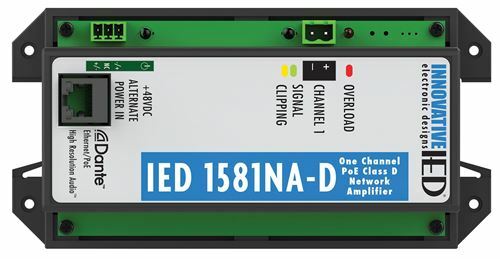 The 1581NA provides a single output with 8 watts of power into an 8Ω load. This makes the module ideal for powering small zones that are made up of only a few low-powered speakers. 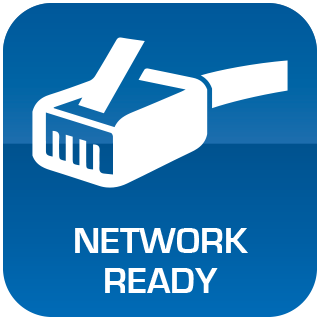 The audio inputs to the module are through the Ethernet audio network and are configured from the GLOBALCOM® System Management Center. Different models are available that allow the use of Dante™ audio networking protocols. The unit is powered using standard PoE and draw a maximum power of 13 watts. If PoE equipment is not used, an input is provided for an external +48VDC power supply. A green power indicator LED is included to show that the unit is powered on. Each channel has a green LED indicator that illuminates when signal is present and a yellow LED to indicate clipping. Another yellow LED illuminates to indicate that the device is in thermal overload. When this condition occurs, the device will stop passing signal until the condition has cleared. 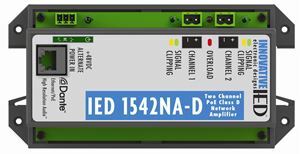 The amplifier is provided in an enclosure that either mounts to a DIN rail or is screwed down on a panel or wall to allow for convenient installation in remote closets close to the speaker zone.